“Stillwell Avenue,” is a thundering monster of a song. Pounding and engrossing. “Steel Caravan,” comes out guns blazing, not slowing down for anything, it continues the monster route. “Realm of Crime,” features some fairly entertaining riffs and melodies. “The Celtic Hammer,” snorts and sticks the finger up at the rage machine. “Two Ton Behemoth,” slithers and snakes and shakes and rattles. 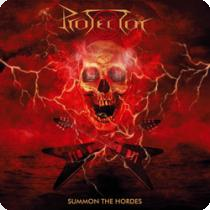 Title track “Summon the Hordes,” is pure thrash metal, aggression and chaos latched together. “Three Legions,” shimmers along and produces some fascinating grooves. “Meaningless Eradication,” delivers a thunderous blow. “Unity, Anthems and Pandemonium,” is simple chaos. “Glove of Love,” snakes around. The album is out on 26th April via High ROller Records.